Hi, It’s time for our monthly update on Operation Digital Nomad, our quest to continue our travels indefinitely by monetizing our travel blog. This month I’ll be focusing on two subjects. First I want to discuss some of the frustrations that come with working while traveling. Second, I want to talk about how I’ve been using Google Trends to help us write blog posts that readers will find useful. But first, as always, the bottom line. Well, look at that! In December I was very excited to report our first profitable month, but January just went and blew it out of the water. We more than septupled our profit margins, due almost entirely to the sale of some images to the Wall Street Journal, which needed images for an article about Dubrovnik, Croatia in the off season. The WSJ has a paywall, so if you want proof that the article exists, here’s a screenshot with our very pretty photo featured prominently. 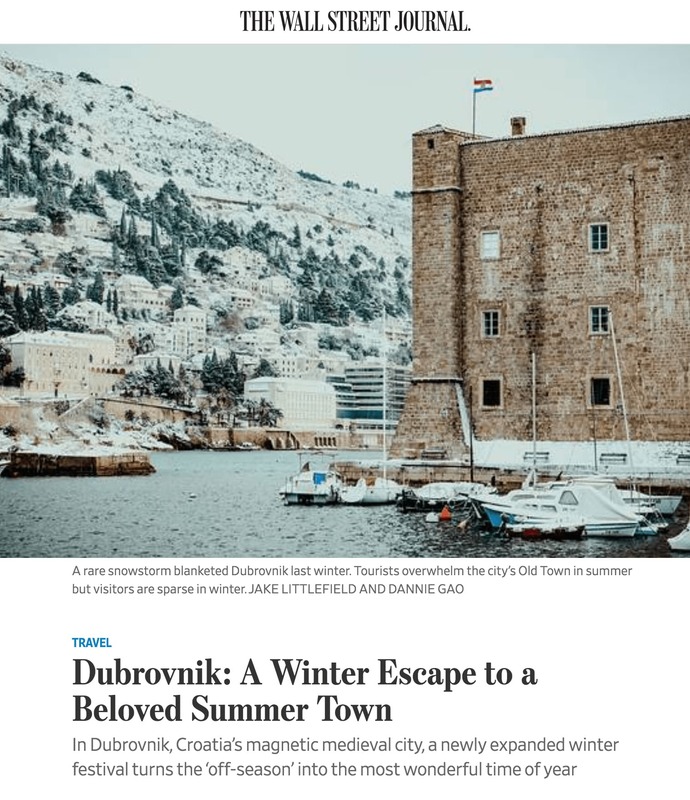 Ironically, if you do a Google Image search for Dubrovnik in Winter, our photo now appears as one of the first results, but it takes you to the WSJ instead of our blog. On the plus side, when someone goes to their site and hits the paywall, they will keep looking and – hopefully – wind up on our page. Our affiliate sales have been…. consistent? People keep clicking on our product links, but still no purchases. I guess that’s the problem with writing a slow travel blog: you level headed, easy going readers just aren’t the type to make impulse purchases. But we love that about you, so don’t change a thing! We’ll just have to sell more photos! If you don’t know, affiliate sales happen when someone clicks on one of our affiliate links (like the ones in the expense section above or on our resource page) and then make a purchase. We get a commission at no extra cost to you. Dannie and I didn’t put up a lot of new content on our blog in January or early February (more on that later), but that doesn’t mean that our blog wasn’t working for us in the background. That’s the nice thing about blogging – you can miss a day or two and not have to close up shop. You just can’t make a habit of it or you’ll start falling behind. In January we got a lot less traffic from sources like social media, since we only published three posts. We did however see an acceleration in traffic from organic searches. I think this is largely due to the time of year, and I’ll be getting into that later in the post when I discuss Google Trends. We had high hopes that we would be very productive with our blogging in January. Instead we were only minimally productive. There were a number of problems I can identify – some of them were beyond our control, and some of them were obstacles of our own creation. And some of them weren’t really problems, just distractions. The first – and most obnoxious – issue we had was hard drive failures. We make two backups of every photo we want to preserve, whether it’s a carefully crafted travel photo, a casual snapshot of Lisa playing in the park, or a bride and groom from one of the weddings we photographed before we embarked on our journey. This means we carry around a number of physical external hard drives to hold all of these images. As we were wrapping up our year in Europe, we began to realize that it was time to purchase a new set of hard drives. Our current ones were working fine, but they were getting full. We have tried a number of methods for shopping overseas. In all of the cities we’ve visited in Europe, it was possible to order products from Amazon or other online retailers, but there were often if not always obstacles and limitations. For one thing, some products that we’d be able to buy in the United States (Pixel or Nexus phones for example) can’t be bought in much of Europe. Also, delivery from one country to another can be slow and expensive. Finally, though we were usually in one place for long enough to receive a package, the fact that we were staying in Airbnb apartments instead of a place of our own often presented difficulties when it was time to receive a shipment. In Budapest, for example, our apartment didn’t have a mailbox or a ringer, so there was no way for a delivery person to notify us of their arrival. Eventually we found an electronics store that sold external hard drives, and we bought two 4TB Western Digital MyPassport hard drives and cases to protect them. We were able to fit the rest of our European photos on our current drives, with the intention of using our new ones for the next leg of our journey in Asia. But after a week of taking photos in Hong Kong and Xiamen, China and backing them up to the new hard drives, we noticed that they were running very slowly and taking a long time to mount and eject from our computer. To make a long story short, we eventually found that all of the photos we had saved in 2018 were now completely inaccessible. After a couple days of trial and error, a few late nights and a lot of emails exchanged with tech support (no refunds! ), we were able to reformat the drives and import our photos again from our camera’s SD cards, which we had very luckily not yet reformatted. Only hours after re-importing the photos, the hard drives failed again. Tech support urged us to reformat the drives a second time, but honestly, we were never going to trust those particular drives to hold our valuable work ever again. We took a bus into downtown Xiamen and purchased a third hard drive. It died before we could even import all of the photos and our computer couldn’t even recognize when it was plugged in. In the meantime, we had been going out and taking more photos – because that’s what we do – and we had now filled up all eight of our SD cards with images that had not yet been backed up. If we couldn’t back them up, we couldn’t clear the SD cards, and that meant we couldn’t take any more photos until the issue was resolved. We were starting to get nervous and didn’t know how much money we were going to have to pour into new hard drive before we were finally able to resolve the problem. We considered the possibility that either our computer or one of its cords was actually creating the problem, except that all of our other hard drives were working without difficulty. Since we had never had a serious hard drive problem before, we took for granted that the drives we purchased were going to function out of the box. 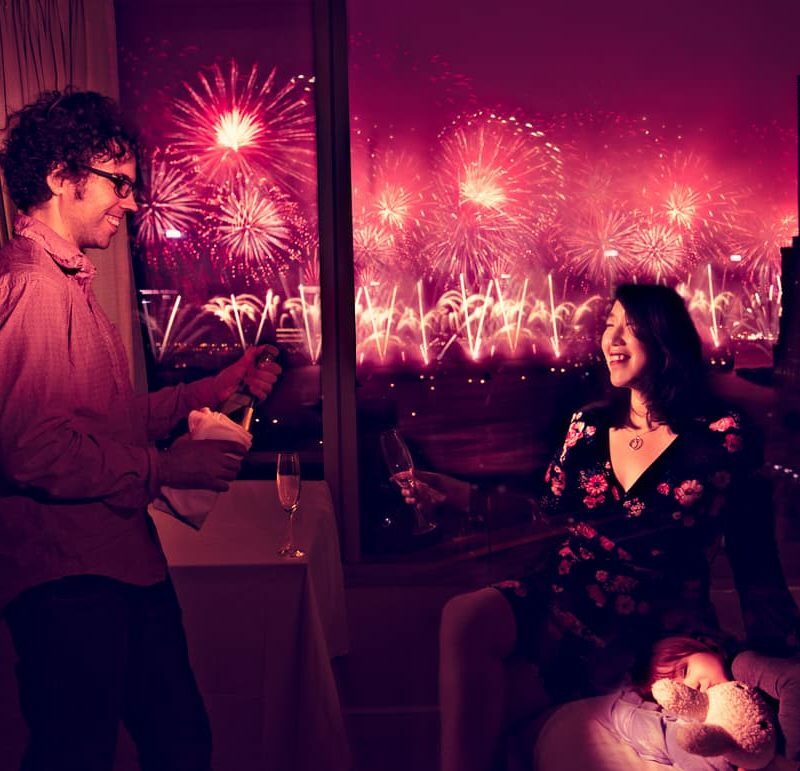 We had made sure that they met all of our compatibility requirements, but we should have tested them before we left the city in which we made the purchase. We could have easily returned and replaced them there, instead of in China where electronics stores are less reliable and accountable. That would have kept us from getting to the point where we couldn’t even take any more photos. A lot of people say that Xiamen is like China’s Florida. It’s a city in the Fujian region in the country’s south. 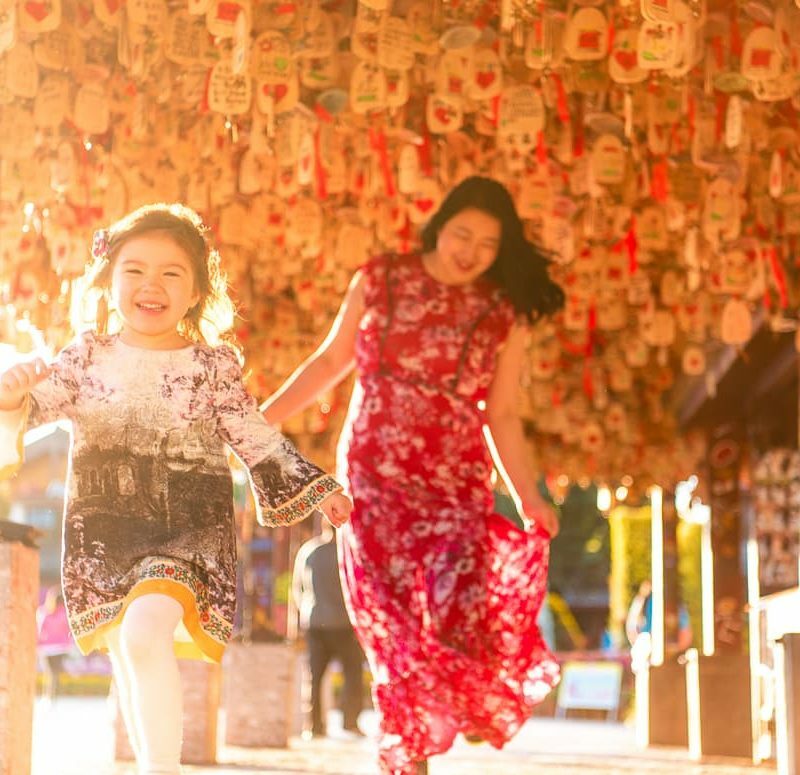 It’s generally much warmer than the rest of China, and many Northerners go there in the winter for vacations or as a longer escape from the snow. But in a region that is known for its palm trees and sunshine, many homes are not equipped to stay warm when the temperature actually does drop. We have noticed that as we travel through the world, the locals are always explaining to us that the weather “is never like this.” Maybe we just bring abnormal weather with us. Maybe it is climate change. Or maybe it’s just weather in general is just not as predictable as we all think it is. Whatever the issue, our stay in Xiamen was very cold. We had ditched our winter jackets in Vienna, assuming that we wouldn’t be needing them and wanting to cut down on our luggage as we adventured in the East. Our apartment, which we rented through Airbnb, was clearly meant for warm weather. It had air conditioners but no heating. The apartment was on the ninth floor of a high rise, and when the wind blew, we could feel it on our skin inside the bedroom, even when under the blankets. I examined the windows and found that they didn’t close properly, and often had big gaps between the panes and the window frame. The temperature was often in the low forties, and the difference between the inside and the outside for us was negligible. We felt like we were tent camping in Glencoe again, except we didn’t have zero degree sleeping bags. As we discovered in Glencoe, sitting down to work at a computer, whether writing a blog post or editing a photo, is exceedingly difficult when your hands are numb and your teeth are chattering. It dawned on us by the time we were packing up to leave Xiamen, that we should have gone out and purchased a space heater on the first day. It’s true that we had every reason to believe that the weather would improve, but it probably wouldn’t have cost us much to ensure that the rest of our stay would be comfortable and productive. We should have treated it as an insurance policy as soon as we realized that the apartment wouldn’t protect us when the wind blew. By the time we thought of this it was too late, but we made a note of it for future rentals. If we do wind up purchasing actual appliances for our airbnbs, it won’t be the first time we leave them better equipped than when we arrived, but it we’d rather not have to leave behind more than a mixing bowl. 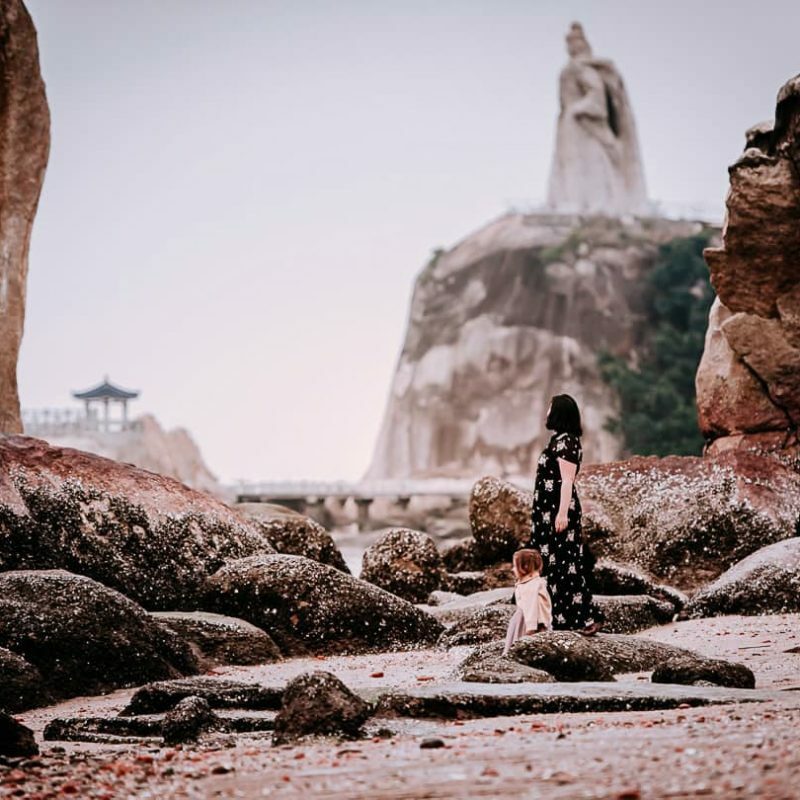 We found, like we did in Glencoe, that it was easier, and better for our relationship, to go with the flow and embrace the positive aspects of our time in Xiamen. Though our January in Xiamen was cold by local standards, it was substantially warmer than December had been in Vienna, Austria. While Vienna was indeed a beautiful place to see Christmas markets and sip mulled wine, we actually found that it was more of a winter wonderland for adults than it was for children. A dearth of playgrounds, and bitterly cold winds (regularly 20mph), made outdoor activities very difficult for Lisa to enjoy. 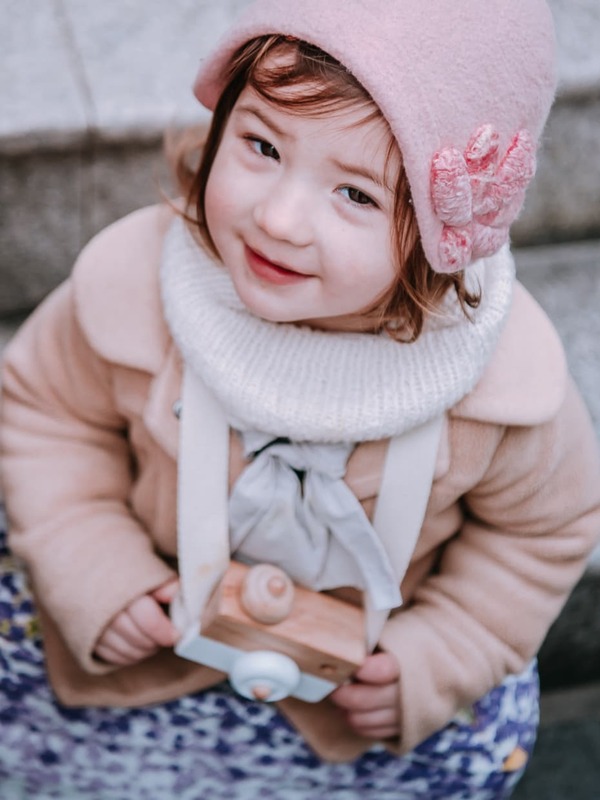 Though we bundled her up, she always looked a bit miserable riding in her stroller, and we never saw another child her age playing anywhere in the city. We spent a lot of time trying to keep her busy inside, and made the most of our time together. Overall, it was kind of a boring month for Lisa. When we got to Xiamen, it may have been chilly, but at least there was no danger of frost bite. On the beaches and in the many playgrounds we saw, parents and their toddlers were out and about, enjoying themselves and socializing. The draw of the city was hard to ignore, and we spent a lot of time watching Lisa running around in the sand, chasing other children and finally getting some authentic engagement for her developing mind. Because this was so much fun to watch, and because sitting in that freezing apartment was so miserable, both Dannie and I wanted to be out there with her. We chatted with other expat parents and we made sandcastles and searched for shells. So even though our days in Xiamen weren’t very productive for our blog, they were very rewarding in other ways. We just wound up treating it like a vacation. As far as productivity is concerned, this one is on us. 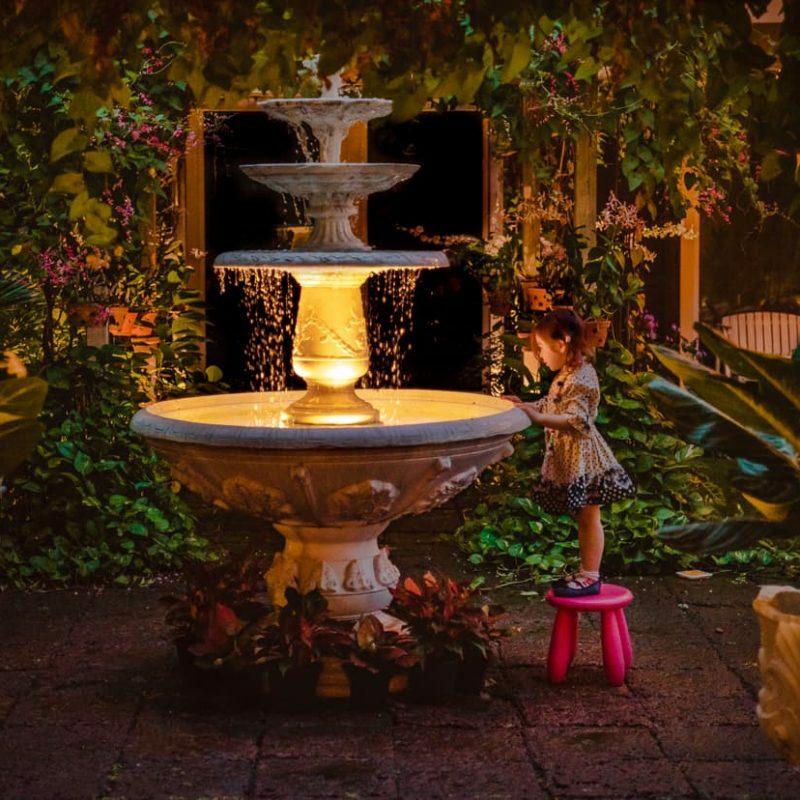 Taking Lisa out to play doesn’t have to be a two-parent task. One or the other of us could have been getting bits and pieces of work done, even if it was uncomfortable. What can I say? Just take a look at this picture and tell me you could resist. That being said, looking at this picture also reminds me of what we are working for. We do owe it to Lisa to do the work necessary to create the life we want for her. 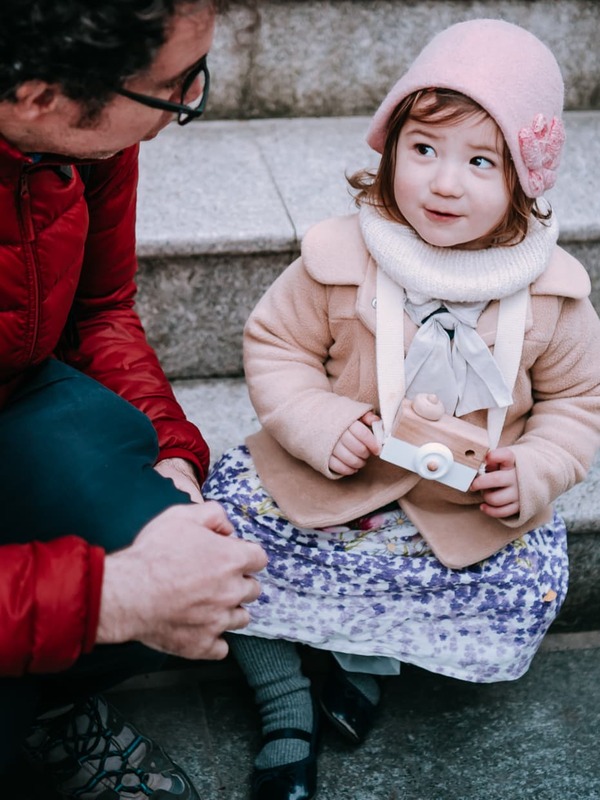 Though taking her out for new experiences, learning, and socialization is very important for her wellbeing, it is also selfish of us when we prioritize personally witnessing those experiences over other responsibilities we have. We always have to strive to do better, especially when we are setting our own schedule and the decision to work or play in any given moment is ours alone. I’ve mentioned in other posts that we try our best to use search engine optimization (SEO) techniques whenever possible. The benefit of doing this is that it helps put the information in our posts in front of the people who are searching for that information. Not only does this mean that we get more traffic from the kinds of readers we want to have, it also means that we are being more helpful to travelers and families in need of advice. It even means we are being helpful to people who don’t want to read our posts because we are deliberately making sure that search engines like Google know who to serve us to. We can use tools like Google Analytics and Search Console to see who is finding us and how. But there is another tool that we can use before we even write our posts, that allows us to gain insights into what kind of information our potential readers are looking for. Google Trends is a very useful site that helps you examine what searches related to your topic are being searched for and what terms are being used in those searches. Of course, using the tool correctly is both an art and a science. When I first started using it, I was mostly just spinning my wheels, but over time, with a little research, I’ve actually started to find it pretty useful. As an example of what I was doing wrong at first, I’ll show you the first search I ever did, months ago. Since I was looking for search terms related to our field, family travel, I decided to see what would happen if I just typed in “family travel.” Here is the information I got. 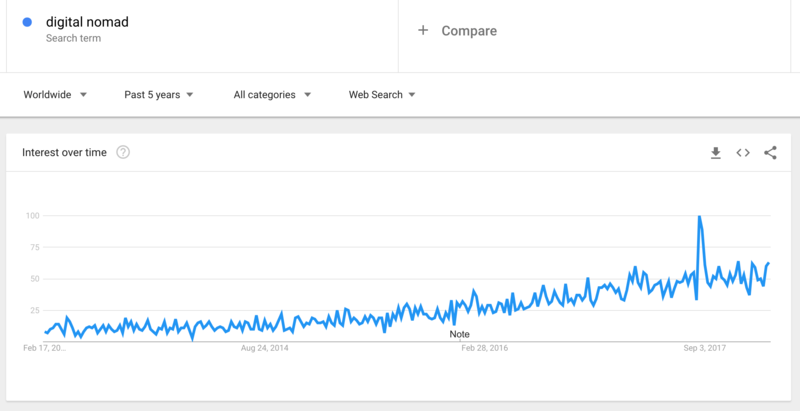 This graph shows how often people searched for that term over the last five years. As you can see, the search term has performed consistently over that time period, predictably rising and falling with the seasons. My takeaway from this graph was a feeling of encouragement: Even though we were currently in one of the troughs of the graph when fewer and fewer people were searching for the term, our blog was receiving more and more traffic from search engines. This boded well for the future months when the graph would tick upward again. Similarly, this graph, showing the performance for the search term “digital nomad” showed a positive trend of interest that we could probably exploit. (Note the big uptick in August 2017, just two weeks after I announced Operation Digital Nomad. Coincidence?). But, heartening as this information might be, it wasn’t exactly actionable. In order to use Google Trends to actually drive traffic, you have to think about the search terms that your readers are actually using and that you actually have a chance at ranking for. One thing to keep in mind is that SEO is intended to boost the traffic to a specific post. When someone looking for advice on family travel does a search, they don’t just type in “Family Travel” and see what comes up. They ask specific questions about what they are hoping to do and how they can do it. Obviously the term “family travel” does appear in search terms, but it is surely in the context of longer queries like “family travel destinations” or “what to pack for family travel.” We could try to rank for “family travel” straight up, but we would have almost no chance of appearing, and an individual post about “family travel,” would be so broad and general that we wouldn’t even know how to make it helpful. 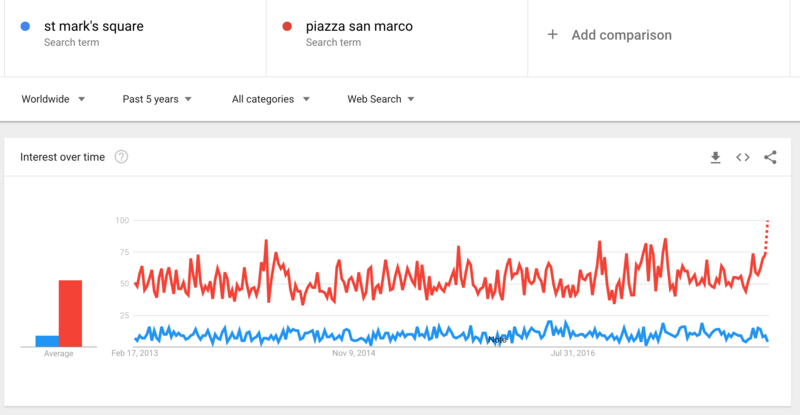 It seemed that pretty much everyone searched for the Italian name instead of its English translation, so that’s what we went with (here is our article about photographing Piazza San Marco). We are also currently working on a post about photographing the lavender fields in Provence. In this case, we wanted to find out exactly what questions were being asked that we could provide the answers for. Our goal is to get as specific as possible in our terms. After all the generic terms are contained within the specific ones, but not the other way around. As you can see, the red “Provence lavender” performs better than the blue “Lavender in Provence,” so that is the wording we decided to focus on. We chose to narrow down our topic and focus on “Provence lavender fields” rather than “Provence lavender season.” There are two reasons for this. First, there were more searches for Provence lavender fields, because finding the fields can be very difficult. Secondly, there is very little for us to contribute to the topic of “lavender season.” A blog post that just says lavender season is early July wouldn’t be likely to rank very high or provide much use to anyone. We spent a long time searching for the best lavender fields, and we felt that we could really contribute to the subject for future travelers and photographers. So when we publish that post, the main focus will be on where to find the best lavender fields in Provence (or should I say the best “Provence lavender fields?”). Update: “Where to photograph Provence Lavender Fields” is now live! We’ll also make sure that we use sentences in the post that we think people are likely to type in word for word when the do a search, like “where to photograph Provence lavender?” Something that specific won’t even show up in Google Trends because there won’t be enough data, but we know that people searching for that will find our post very useful. Additionally, the people who search for terms like that are likely to enjoy our blog in general, and stand a good chance of becoming regular readers. The reason it helps to be specific in your focus is that it is easier to rank for a specific topic than a broad one. Broad topics may get more searches, but there are also many more posts to compete with, and the first few that show up will get nearly all the clicks. Our goal is to rank high for some very targeted searches. Over time as our travel blog grows and becomes more popular, it will also start ranking for the broader searches since they are included in the specific ones. The better we get at making our content easy to find for the people who want it, the more effective every effort we make will be. And if our work is more efficient, if we get better results out of every post we publish, then months like this January – when obstacles and distractions are everywhere – will have less of an impact on our business. If all things are equal, then more posts are better than fewer, but three really good posts will always be better than ten mediocre ones. And as we internalize the process of making our content easy to find, we’ll be able to do it faster and faster, which will leave us with a lot more time to solve the everyday struggles that get in our way. The better you get, the better you are at getting better. Thanks so much for stopping by to read our update. If you’d like to read about previous months, you can check out our Operation Digital Nomad page. And if you’d like to support our travels, consider heading over to our resource page where we have links to products and services we make use of all the time, some of which will provide us with commissions if you make a purchase. And finally, please don’t forget to sign up for our email list so we can keep you in the loop. We don’t have a chance without all of our amazing readers, and we are so grateful that you take an interest in our photography, our stories and our mission.